If selected, this option causes Quick Viewer to switch to the full screen mode immediately on its use. If this option is not selected, then the image is initially displayed in a resizable window. If selected, this option causes Quick Viewer to switch to the full screen mode automatically when you choose the Run slideshow command. 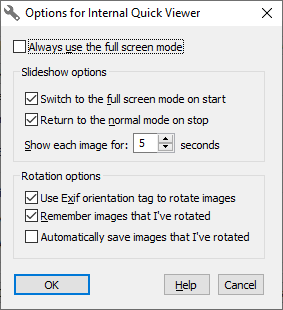 If selected, this option causes Quick Viewer to switch from the full screen mode back to the normal mode automatically when the slideshow ends. Lets you specify how long each image should be shown in the slideshow mode. If checked, this option causes AB Commander to look for the Exif orientation tag in the image properties, and, if found, to display the image rotated according to the tag. If checked, this option causes AB Commander to remember the orientation of the images that you have rotated, so that when you view them next time with the Quick Viewer command, they would be displayed with the orientation you have chosen last time. If you clear this option, then AB Commander will not store such information, and it will also erase such information for the previously viewed images, if any. NOTE: AB Commander keeps the image rotation information in the file abcmdrir.ini, located in the Application Data folder (such as C:\Users\User\Application Data). You may want to add this file to your backup set of files, to preserve the image rotation information. If checked, this option causes AB Commander to save the images that you have rotated, without prompting you to confirm that you want to save them. If this option is cleared, then AB Commander does not save the rotated images automatically; however, you can still save them manually using the Save rotated image button on the toolbar of the Quick Viewer window.